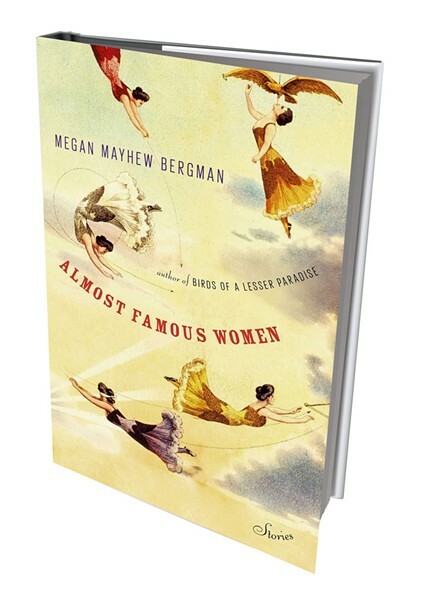 Almost Famous Women by Megan Mayhew Bergman, Scribner, 256 pages. $25. Each of the 13 stories in Shaftsbury writer Megan Mayhew Bergman's engrossing second collection, Almost Famous Women, begins with a photo or painting of the real woman whose life inspired the story. So it's almost inevitable that readers will peruse the fascinating images and their captions first, looking for women they recognize. Many of those faces, however, may not be familiar. There is the Romantic poet Lord Byron's illegitimate daughter Allegra, dead at age 5; and Daisy and Violet Hilton, conjoined twins who were vaudeville and burlesque entertainers in the 1920s and '30s. There are women who pulled off daring physical feats for their time and then faded from view: an aviator (Beryl Markham), a speedboat racer (Standard Oil heiress M.B. "Joe" Carstairs), a stunt motorcyclist (Hazel Eaton). And there are writers and dancers and artists, such as the 1920s Left Bank painter Romaine Brooks, whose work inexplicably failed to make a lasting impression. Yet, by the end of Almost Famous Women — and the bout of googling it inspires — each of these women has become unforgettable. Like a literary version of Judy Chicago's installation piece "The Dinner Party," Bergman's book assigns each woman her place at the table. The portraits, often drawn near the end of life or after the possibility of fame had passed, create a sense of each woman and the compromises she faced. Sometimes Bergman accomplishes this in astonishingly few pages. A story from her first collection, Birds of a Lesser Paradise, was chosen for The Best American Short Stories 2011, and her talents are no less on display here. James Joyce's daughter Lucia emerges as a mind to grapple with in the three-page "Expression Theory," a masterpiece of compression. "Aggression is ugly in a woman," silently muses Lucia — called "L" in the story — after having thrown a chair at her mother. This act prompted the real Lucia Joyce's lifelong institutionalization for insanity, cutting short the career she might have pursued in modern dance. But Bergman's Lucia hardly notices what she has done; she's working out how to choreograph her thoughts about the human body. "What if I bastardized a grand plié, assumed the position of birth, squatted down like a woman in the Amazon? L thinks as her mother sobs. Would that look useful?" Always present in these stories are the ghosts of the men who did become famous. In the background of "Expression Theory" hovers Joyce, whose total absorption in his creative work (aside from drinking) was, unlike his daughter's, not just tolerated but celebrated. Ernest Hemingway, an ambulance driver during World War I, is the shade evoked in "Who Killed Dolly Wilde?" — the story's protagonist, Oscar Wilde's niece, also drove one. "Papa" is also evoked in "The Siege at Whale Cay," about Carstairs, who was the "fastest woman on water" and another ambulance driver in the same war. Those two stories use fiction to explore the phenomenon of post-traumatic stress disorder inflicted on women by their war experiences, something that didn't even register at the time. Dolly is portrayed in her drug-addled old age through the eyes of a close friend, a younger woman who once fell in love with her. The latter, unnamed, discovers letters Dolly wrote but never sent describing the horrors of her war work. One reads, "The flesh has been burned from his body, what's left of his body. There's no nose or mouth, just eyes." This "face of fire" belongs to a living soldier she must transport back from the front line. The real Dolly, an admired London wit and socialite, never wrote the book many expected her to. Could PTSD have accounted for that failure? Bergman's story, set during the subsequent war's bombing raids, leaves the reader to wonder. In an author's note, Bergman explains, "While I absorbed facts about these women's lives, I did not stay inside the lines." Ultimately, it's the reality Bergman creates in her stories that counts. One mark of her success is that a character such as Dolly's friend and narrator can muse convincingly about a phenomenon feminists have pondered at least since the 1970s: "Maybe the world has been bad to its great and unusual women. Maybe there wasn't a worthy place for the female hero to live out her golden years, to be celebrated as the men had been celebrated, to take from that celebration what she needed to survive." Like "Who Killed Dolly Wilde?" many stories are told through the eyes not of the almost-famous woman in question but of someone who knew her. In "Romaine Remains," Romaine Brooks is a sharp-tongued 93-year-old observed by her envious male servant. The younger man attempts to absorb his employer's fame and eventually control her fate. Readers of "Hell-Diving Women" get a glimpse of the 1940s African American jazz trumpeter Tiny Davis — and her fearless comments into the mic challenging audiences' blatant racism. The story is told from the point of view of Ruby Lucas, Davis' lesbian partner and the drummer in her band at the time, the integrated, all-female International Sweethearts of Rhythm. Ruby worries about Tiny's chutzpah; the trumpeter lately addressed her southern audience with the words: "When I think of the south, I think ... of those three bad brothers, Klu, Kluck, and Klan." Less successful in inhabiting the reader's imagination is "Hazel Eaton and the Wall of Death," told in third person without an outsider's viewpoint. "She retreats into her memories and recalls the way a storm looked," writes Bergman, using the fatal tactic of telling, not showing. But this story, capturing the motordrome motorcyclist's thoughts after a near-fatal crash, allows Bergman to imagine the motivation behind Eaton's refusal to stop performing her death-defying act. "Nothing has topped the way men shake her hand and look her in the eye, what it's like to be able to call a man chickshit to his face and get away with it, to mean it, to feel free and dominant and in control of your life." The story begins with the poet's daughter's arrival at a convent in northeast Italy, where she will live out the last two years of her short life. "I don't like it" is the imperious 3-year-old's first comment. "I watched her quietly," says the woman who will allow herself to develop an affection for the girl — an unnamed first-person narrator who came to the convent after burying her own newborn child and husband. "The way she pretended to play while eyeing her chaperones' every move. Her anxiety was evident. She moved to clutch at the knees of the lead chaperone." Allegra's fate during her stay, and that of her caretaker, is to learn that her famous parents have abandoned her. That gradual realization has its greatest impact at the end, when the narration absorbs the caretaker's bitterness: "Lord Byron made a show of his grief and sent for her body as if it were a rare volume, the thing that had been missing from his library all along." Passages like these, one hopes, will help this fine author achieve the lasting recognition that eluded her almost-famous subjects. Excerpt from "The Siege at Whale Cay"
There was the cinder-block changing room that smelled of bleach and brine. On the door hung a gold star, as if to suggest that the showgirls could claim such status. A bucket of lipsticks sat on the counter, soon to be whisked away to the refrigerator to keep them from melting. Georgie pulled on her mermaid tail and slipped into the tank, letting herself fall through the brackish water, down, down to the performance arena. She smiled through the green, salty water and pretended to take a sip of Coca-Cola as customers pressed their noses to the glass walls of the tank. She flipped her rubber fish tail and sucked air from a plastic hose as elegantly as she could, filling her lungs with oxygen until they hurt. A few minnows flitted by, glinting in the hot Florida sun that hung over the water, warming the show tank like a pot of soup. Letting the hose drift for just a moment, Georgie executed a series of graceful flips, arching her taut swimmer's body until it made a circle. She could see the audience clapping and decided she had enough air to flip again. Breathing through the tricks was hard, but a few months into the season, muscle memory took over. Next Georgie pretended to brush her long blond hair underwater while one of Sarasota's many church groups looked on, licking cones of vanilla ice cream, pointing at her. How does she use the bathroom? Can she walk in that thing? Hey, sunshine, can I get your number? The original print version of this article was headlined "Gone Girls"
Katha Pollitt and Janell Hobson: What Can Feminism Speak To?